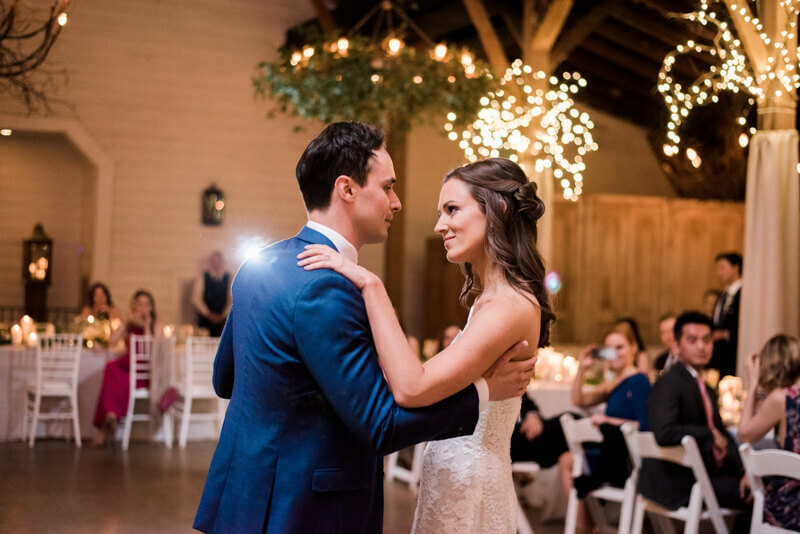 From the bride: We were lucky enough to get married in the Gardens at Fearrington, and it was very important to us to incorporate the beautiful scenery and southern charm of the venue into every aspect of the wedding. We wanted the design to feel both elegant and natural, and so we incorporated live greenery into the decor wherever we could using white backgrounds and pops of gold. Q: Let's talk fashion. How did you both choose your wedding day look? Describe the looks in detail. A: When I started searching for wedding dresses I didn't have any particular designer in mind, however the Sia dress from Monique Lhuillier perfectly represented the style I wanted. To me, it was southern, elegant, and would fit in perfectly with both the garden ceremony and barn reception. 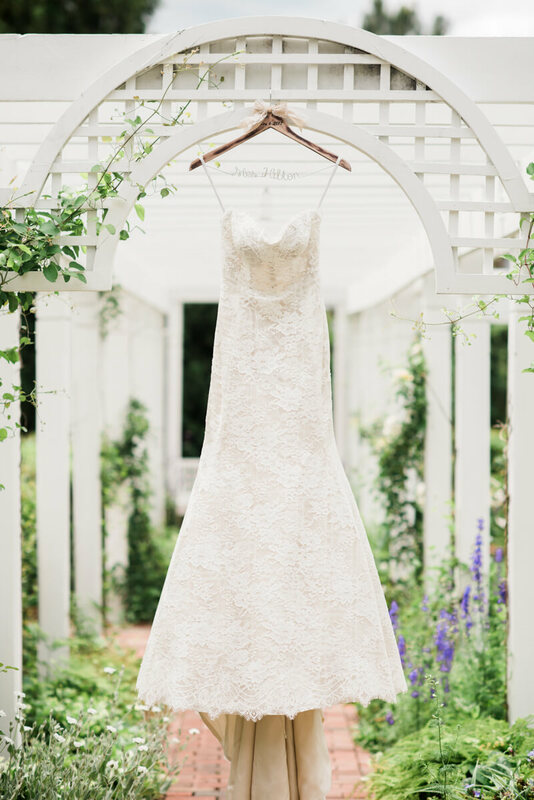 The alterations specialists at ML can work absolute magic with fit, and I was also fortunate enough to have them create a custom off-the-should capelet using the lace from the gown, that I wore for the ceremony. 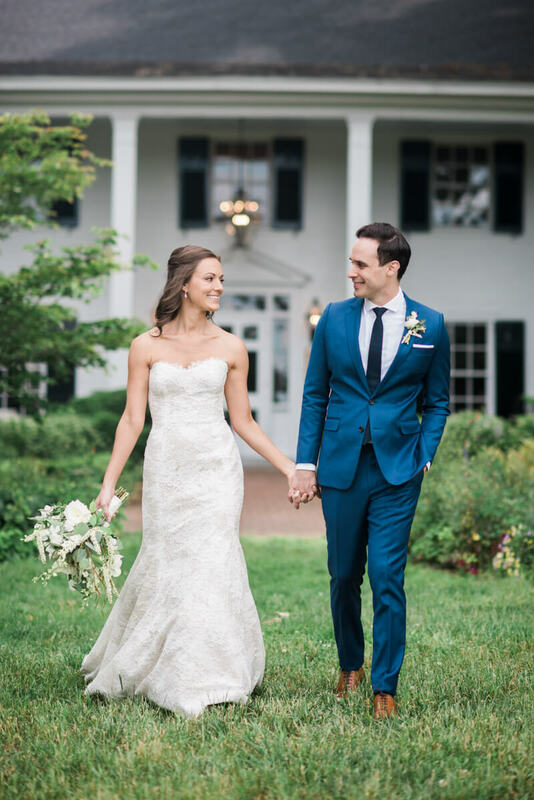 The combination absolutely created my dream dress.My husband knew he wanted a custom suit from Bindle & Keep. Daniel was very patient with us as we went through every detail. He wanted a navy suit but also wanted to stand out from his groomsmen, and the specialists at B&K helped us find the perfect color and fabric for the occasion. A: We were most excited about the music (especially during cocktail hour) and we were certainly not let down, but I think the most special moment ended up being shortly after the ceremony and before cocktail hour. The nerves of the day had past and we had the opportunity to be alone with each other, have a glass of champagne, and just reflect on the fact that we were now married. It was probably only 5 minutes but it was a nice quiet reminder of what the day was truly about, us finally being husband and wife. A: Do your diligence when hiring your wedding vendors. My vendors were PHENOMENAL every step of the way and helped provide their own expertise/experience while also letting use create our own personal dream wedding (special thank you to A Swanky Affair and Krystal Kast). I have friends who did not feel the same way about their vendor choices and it caused a lot of stress throughout the whole planning process.